U.S. Retail Trade – 2016 $ales Update by Channel – Going for the Gold! The Total U.S. Retail Market in 2016 reached $5.5 Trillion dollars – up $172B (+3.2%). This is significantly better than last year’s (+2.3%). In 2016, the decline in Gas prices slowed but still caused a $25B drop in Gas Station revenue. At the same time, the increase in Auto and Restaurant sales also slowed. For this report, we will focus on the “Relevant Retail” Total – removing Restaurants, Auto and Gas Stations from the data. This still leaves us with $3.3 Trillion to “divvy up”. 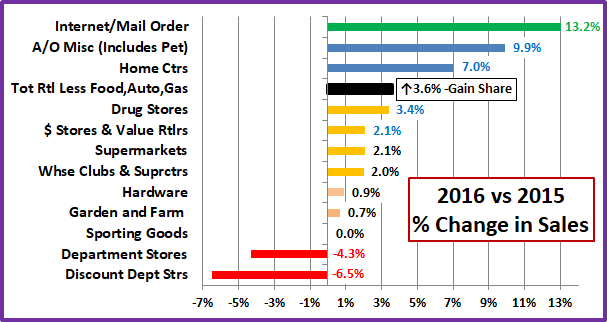 Retailers other than Pet Stores generated 66.5% of all the Pet Products revenue in the U.S.
Pet Products, on average, generated 1.94% of the total revenue of all non-pet stores that chose to stock them. Restaurants (Food Service) – 12% of Total Retail – up 5.9%, which was about 25% less than last year’s (+8.1%). Retail, Less Food, Auto and Gas – Up 3.6% to $3.3 Trillion, about the same as last year’s +3.5%. It is 59.8% of the total U.S. Retail market and is growing 12% faster than the Total but still slower than Restaurants and Auto. To put this year into perspective, let’s look at the overall performance in recent years. The U.S. retail market has grown each year since 2012. It is just a matter of how much. In 2015 the precipitous drop in Gas prices had a huge impact on the overall market. Restaurants have shown accelerating growth but dialed it back in 2016. Auto sales are still strong but the growth is slowing. 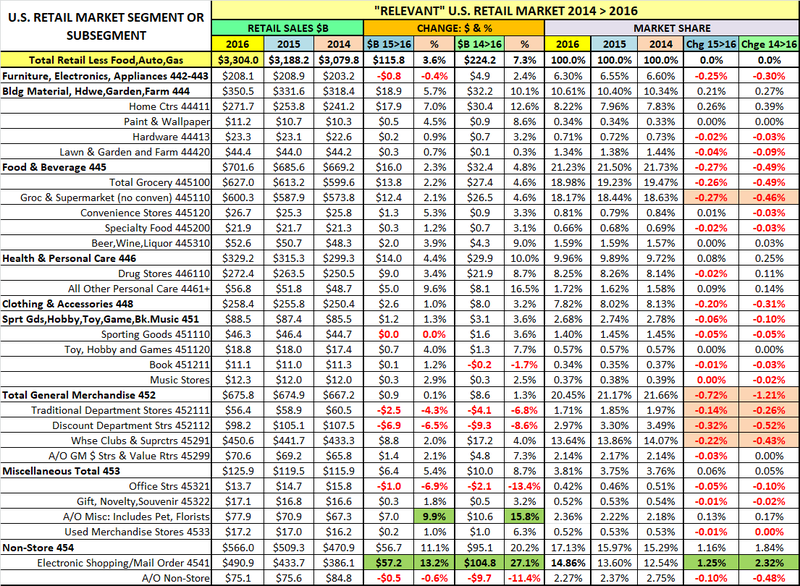 Our “Relevant Retail” Segment has been the most consistent. As expected, its 3.6% growth is below the 4.2% increase of the Top 100 Retailers. However, it will serve as a benchmark as we review the individual channels. Above 3.6%, a channel is gaining market share; Below 3.6%, they are losing share. Now, we’ll slice up the U.S. “Relevant Retail” Channel “Pie”. These are large slices of the U.S. Relevant Retail pie. Three divisions – General Merchandise Stores, Food and Beverage and Non-Store account for 58.8% of the total. This is up slightly from 58.6% in 2015. The increase is all from Non-Store Retailers. The other two major segments are losing share. All are very important to the Pet Industry. In our analysis of Pet Products Sales based upon the 2012 U.S. Economic Census, these three major divisions produced 59.7% of total Pet Products sales. Consumers spend a lot of money in Pet Specialty Stores but Pet Products are also “on their shopping list” in the outlets where they spend most of their money. Because they are so huge, major Divisions of the market generally don’t show much movement in market share in just one year so the changes in General Merchandise, Non-Store and Food & Beverage are very significant. Each of the major divisions includes a number of sub segments. For example, General Merchandise includes Traditional Department Stores, Discount Department Stores, Supercenters and Clubs as well as $ and Value Stores. These specific retail channels can have even greater movement in share because this is the level that the consumer “views” when making their initial shopping choice. Change at this level is where any ongoing consumer shopping migration first becomes apparent. Here is the Market Share change “Rule” for 2016: To gain 0.1% in Market Share your $ increase must exceed the amount generated by a 3.6% sales increase PLUS an additional $3.3B. 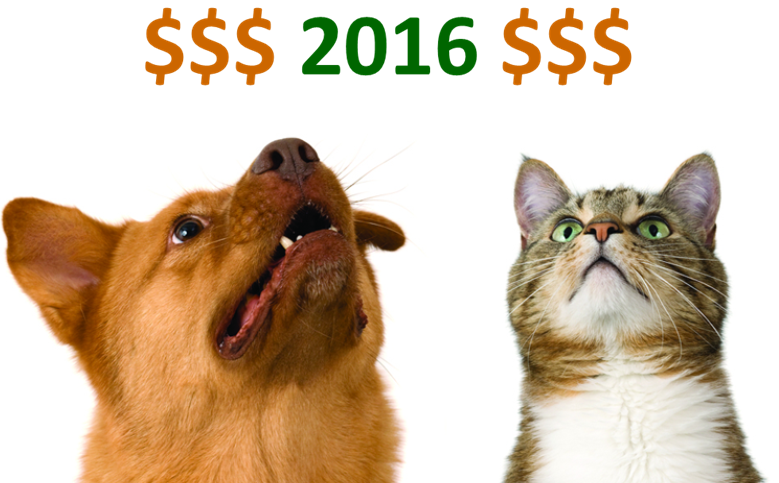 Example: If a channel did $100B in 2015, they need to do $100 +$3.6 + $3.3 = $106.9B to gain just 0.1% in 2016 share. You will see channels with revenue increases that still lose share because the increase was less than 3.6%. It shows that even small changes in share are significant. With that overview, we’re ready to drill deeper into the data. Let’s look at the 2016 performance of some of the specifically “Pet Relevant” Channels to see which are doing the best…and worst in gaining consumer spending. Eleven of the twelve were chosen because they generated at least 1% of the Total Pet Products (food & supplies) spending in the last Economic Census – 2012. I have also included Traditional Department stores on the list even though they have never truly embraced Pet Products. They have long been a fixture in the U.S. Retail Marketplace. Their continued decline, as consumers migrate to outlets which better fit their needs, has profoundly affected U.S. retail shopping as generally they were the “anchor” stores for the Shopping Malls across America. Remember, you must be up at least 3.6% or you’re losing market share! The leader comes as no surprise. However, 9 of 12 these pet relevant channels, including some huge ones, are losing market share. 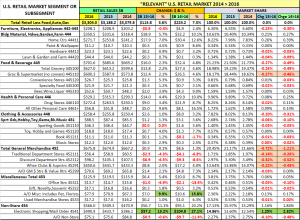 In the next chart, we’ll “show you the money!” Remember, the Total increase for the “Relevant Retail” Market was $116B and you must be up 3.6% PLUS $3.3B just to gain just 0.1% in Market Share. The relative growth in the Internet/Mail Order Channel is even more pronounced when you look at the change in $ spent! 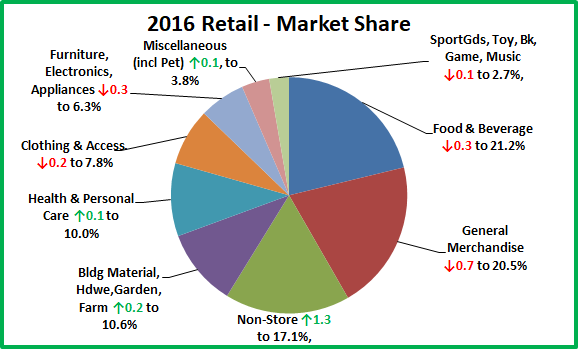 The chart below puts the Market Share of each of these segments for 2016, 2015 & 2014 in a visual format so that it is easier to appreciate the relative sizes. Growth in share since 2014 is indicated by a green box, a decline is boxed in red. Now we’ll wrap it up with a brief summary and a detailed chart for future reference. 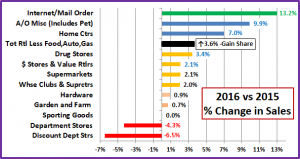 Pet Stores remain #1 for Pet Products. However, in the Overall Market, there are 3 Olympic Medalists. In 2016 the gold still belongs to Supermarkets. As you recall, in 2015 we saw the race for the Silver between SuperCenters & Club Stores and the Internet/Mail Order segment really “heat up”. In 2016 that race was all over. Internet/Mail order took over 2nd place in March and continued to pull away. They have now set their sights on the Gold, which has been held for many years by Supermarkets. Amazon, the largest retailer in the segment, has indicated that they will now actively pursue the fresh grocery business. In fact, they recently purchased the Whole Foods Supermarket Chain to facilitate that effort. Supermarkets (18.2%) currently lead the Internet/Mail order segment (14.9%) by 3.3%. In 2014, the lead was 6.1%. Supermarket sales are increasing, but not fast enough. Unless something radical happens, Internet/Mail Order will become the #1 U.S. Retail Channel no later than 2019 and perhaps by 2018. Overall, 2016 was similar to 2015 – with a 3.6% increase, up slightly from 3.5%. Once again the Internet/Mail Order Channel provided most of the excitement and 49.4% of the growth. The big increase by the A/O Miscellaneous Channel, which includes Pet Stores and other smaller format retailers, seemed to reinforce a less publicized consumer trend to more personalized shopping. After years of growth, the $/Value Stores segment may have plateaued but the big negative was the increasingly sharp decline in sales by Discount Department Stores – down -$6.9B in 2016 and -$9.1B since 2014. The U.S. Retail Market continues to grow and evolve as the consumer migrates to the channels which best fulfill their current wants and needs. This is not a new phenomenon. It has always been that way. Currently, the “Channel of Choice” is Internet/Mail Order and the movement is accelerating. Traditional Brick ‘n Mortar stores will not go away but they must adapt as “electronic” is on track to become the dominant force in U.S. Retail even sooner than we expected. Finally, the Chart below contains Detailed 2014 > 2016 Sales Performance Data for over 30 U.S. Retail Channels.